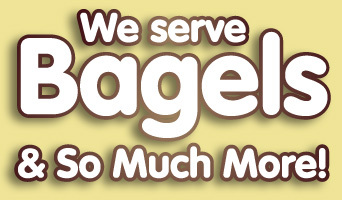 Since 1993, Steve’s Bagels has been preparing delicious New York style bagels. Our bagel dough is handmade in our kitchen. After proofing, they are kettle boiled and baked. This is the recipe for a true bagel. In addition to bagels, we prepare many handmade breads and dessert items as well as soups, quiche, salads and much more using only fresh, natural ingredients. All of our 9 varieties of cream cheese are hand mixed in our kitchen using fresh fruits and vegetables. We offer a great variety of breakfast and lunch sandwiches, wraps, and panini’s ranging from gourmet to the basic and we are happy to prepare your own creations. Stop in for breakfast or lunch or consider us for you next catered event. Check out our delicious catering menu. We have Daily SPECIALS and SOUPS! Join one of our Clubs and earn FREE Salads and Coffee! Copyright 2019 Steve's Bagels and Cafe. All Rights Reserved.